Ensuring your young horse is professionally 'backed' or ‘started’ by a reputable and experienced horse trainer is paramount if you wish to build a solid foundation for future success in general riding, handling and competition for your horse or pony. 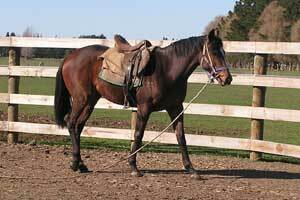 Correct and regular training from a young age has a positive effect on a horse for the rest of their life, which is why it is imperative that the services of an experienced handler be employed when breaking in a young horse. At Blue Springs we appreciate that like people, all horses have varying personalities and different breeds can express various traits. For this reason, we believe in retaining a relaxed yet positive attitude to the program that we design for starting or re-schooling your horse or pony. It is also important that the owner spend time with us during the latter stages of the breaking/training process to obtain a better understanding of their horse, routines and how to achieve the results required. Mark Donald has 30 years of experience in the training, breaking-in and re-schooling of horses for a variety of equine disciplines. The experienced team at Blue Springs have the attitude and belief that good results take time, and there are some horses that do require extra time or handling - we adjust our training methods to suit each individual horse. Mark Donald specialises in teaching horses to handle and cope with pressure; Mark is also very fussy about horses having a lovely ‘soft’ mouth as he believes that the above two factors are the most important traits in a horse to enable it to excel in any equestrian discipline. “I have ‘backed’ over 500 horses and sold numerous horses to many parts of the world. I receive a huge amount of pleasure from the breaking-in and training of young horses, especially when I later see those same horses out in the equestrian community with very happy riders!” - Mark Donald. Our extensive facilities provide horses with a safe and comfortable environment for re-education, breaking-in or training. 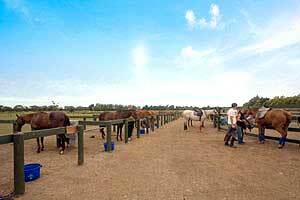 Training facilities include a riding arena, round pen, yards, quarantine area, stables and polo field. 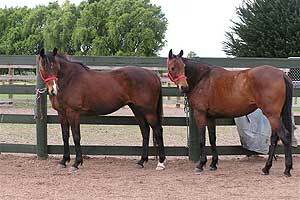 Blue Springs use only reputable equine professionals for all on-site veterinary and farrier services. For further information and pricing for our professional breaking in and starting services, or to discuss a customised training program, do not hesitate to telephone Blue Springs, alternatively you can complete the relevant information area in the online Contact Us form.